I am indebted to Olaf Storbeck of Cycling Intelligence for the background to this post. 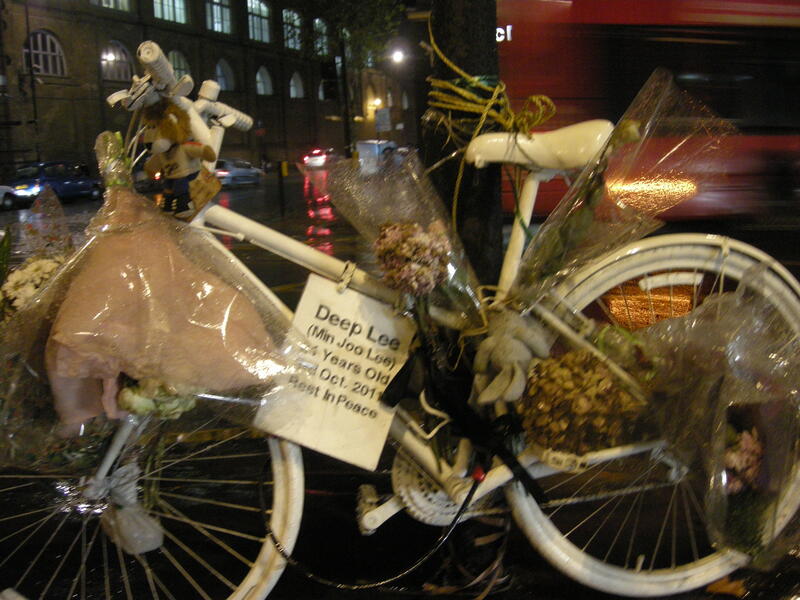 He has published an open letter, written to Camden’s Culture & Environment Scrutiny Committee, by Kenji Hirasawa, the boyriend of Deep Lee, the young woman killed on a bicycle at King’s Cross on 3rd October, 2011. The letter can be read in full on Olaf’s blog, but the substance of it is that, at the junction where Kenji’s girlfriend was run over and killed by a lorry, cyclists are forced into a position close to lorries where they are particularly hard to see. Kenji writes that, with an increasing number of cyclists using the junction, particularly with the new campus of Central St. Martin’s to the north, it is surely necessary to provide a safe cycle lane for these cyclists so they can pass through the junction without risking their lives – a solution ‘like those used in the Netherlands’, in his words. Failing that, he writes, the council should make other roads safer, and actively inform cyclists to use those routes instead. On Monday night, Kenji listened patiently in the Town Hall chamber – a perfect picture of dignity in his blue suit with top shirt button done up – as council officials argued they were mostly meeting cycle safety targets in a presentation of endless graphs and pie charts. A TfL representative insisted that introducing a cycle lane at the junction would “cause considerable queues”, stressing that there was “limited time” to conduct a review of the proposed changes for the junction because of a “commitment” to make them in time for the Olympic Games. “We have taken the comments on board from day one – it is more about whether it is workable,” said Nigel Hardy, TfL’s head of capital development. Installing a cycle lane would not be ‘workable’, according to Nigel Hardy – presumably because of the ‘considerable queues’ that would result to motor traffic. 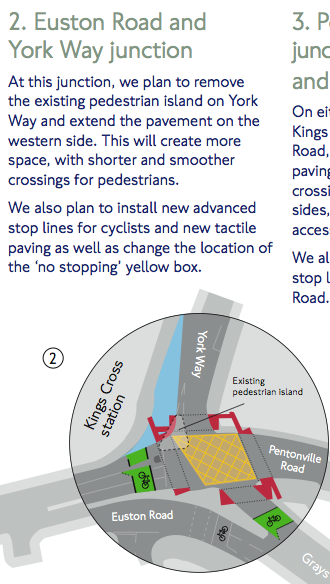 There is a ‘redesign’ planned for the junction next year, but – as Olaf Storbeck points out – the only change at the point where Deep Lee died is a repainting of the advanced stop box, as you can see in my clipping below from TfL’s ‘Improvement Plan. The pavement on the north side is being rejigged, and expanded, but the issue of cyclists being left in the blindspot of vehicles, and completely unprotected should they fail to be seen, remains entirely unresolved. This is not at all surprising, because Transport for London have made their priorities quite plain. So the position can be summed up quite simply. Transport for London have chosen minimizing queueing times for motor vehicles over the safety – indeed, the lives – of vulnerable road users on their network. It cannot be stated more plainly than that. At the approach to the lights where Deep Lee was killed, there are two lanes, designated for motor vehicles, as you can see in the photograph below. Both of these lanes are for north-bound traffic, heading into York Way. Let us ignore the other three lanes of this five-lane gyratory for now. A safe solution for the two lanes heading into York Way, like that suggested by Kenji Hirasawa, would require stripping out one of those lanes, and installing a kerb separated cycle track in its place. But, for Transport for London, this cannot possibly happen. Why, you might ask? Surely the amount of vehicles queuing in the two lanes could simply be redistributed into a longer queue, in just the one lane? There is, you might think, enough space for traffic to back up into along Gray’s Inn Road, behind these vehicles. Having two queuing lanes which immediately merge down to one here is, in my opinion, hazardous in and of itself, because the narrowing encourages jockeying for position, and fast starting, from the lights, at a point where drivers should really be looking out for vulnerable road users around them. You can see the behaviour this road layout encourages in my photograph above, where the driver of the car in the right hand lane quite deliberately invaded the cyclists’ advance stop area, presumably to gain an advantage over the driver beside him as they set off from the lights. The ‘jockeying’ for position is also apparent in the video below. Notice again that, on the other side of the junction, all the vehicles end up travelling in single file. So – to repeat – why do we have two queuing lanes here, and why can one not be reallocated to provide a safe space for cyclists to proceed through the junction? The answer lies in the number of motor vehicles you can get across the junction in a green phase of the traffic lights. If you have two lanes of queuing vehicles instead of just one, then in a green phase of, typically, 15 seconds, you can get double the number of motor vehicles through the junction. 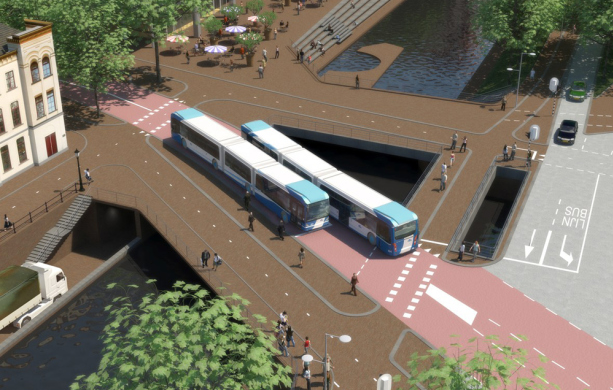 In reality, the ‘throughput’ is probably far smaller – nowhere near a doubling – because of the jostling of merging vehicles through the junction. But this is how Transport for London’s logic works. In their ideal world, they would probably want three queuing motor vehicle lanes here – that would enable them to pump even more vehicles through the junction. This is the pernicious logic of ‘smoothing traffic flow’. It is defined by the percentage of queuing motor vehicles that can get through a junction in a green phase. If all your queuing vehicles pass through – as was the case at King’s Cross while I was standing at this fatal junction – then you have 100% efficiency, and your flow is ‘smooth’. If not, then your junction is inefficient, and probably needs more lanes for queuing motor vehicles. (Transport for London boast that, averaged across all their signalled junctions, they have boosted this ‘efficiency’ from 72% to 80%, following a review of signal timings, covered in their Network Operating Strategy Document). So ‘smoothing traffic flow’, while sounding quite fluffy and neutral, in practice means the near-total allocation of junction space to motor vehicles. This is why Cycle Superhighways disappear at the locations where they are most needed – junctions which are usually the most dangerous. The space is required for queuing motor vehicles, allowing more of them through the green phase on the lights, and ‘smoothing the flow’. This is, as we have seen with TfL’s response to Kenji Hirasawa, their absolute and overriding priority. ‘Smoothing traffic flow’ is also why TfL are refusing to put in pedestrian crossings at the location in the photograph above, and, where pedestrian crossings do exist, they are taking time away from them. Measures like this allow longer green phases for motor vehicles, so more motor vehicles can pass through the junction on their green phases, and, thus we have ‘smoother traffic flow’. As I have written about before, this removal of time for pedestrians is justified by an absurd method of measuring ‘delays’ for pedestrians – namely, by whether queuing pedestrians can cross the road on their green signal, without any consideration of how long they might have been waiting for that green signal in the first place. You could wait for a whole day, a whole month, a whole year, and as long as you manage to cross the road during your brief ‘green man’, you won’t have been delayed at all, according to Transport for London. The fact that you quite obviously cannot measure pedestrian delay in the way you measure delay cars apparently has not occurred to them. Thus ‘smoothing traffic flow’ involves nothing more than worsening conditions for vulnerable road users, in order to minimise queuing times for motor vehicles. I have already described the logic of this approach as ‘pernicious’. You can see why this is so when you consider that those worse conditions for pedestrians and cyclists will not only keep the drivers of those queuing vehicles in their cars – a bicycle is hardly going to seem an attractive option in locations where its users are being killed – but might actually serve to increase the lengths of those queues as the car becomes a more practical alternative, ironically due to the shorter journey times being created by ‘smoothing’ itself, and also as a result of the more hazardous nature of the environment for current vulnerable users. And so downwards we go in a vicious spiral – longer queues mean allocating more time and more space for motor vehicles, taking it away from vulnerable users, and consequently even less incentive to switch from motor vehicles to walking and cycling. The notion that this cycle could be reversed – that we could have a virtuous, instead of vicious, cycle – is not on Transport for London’s radar. This ‘virtuous’ circle would still involve ‘smoothing traffic flow’, but by a very different method. Not by allocating more and more space and time to the motor vehicle, and simultaneously risking the lives of vulnerable road users. Instead, it would achieve ‘smoothness’ by creating safe and pleasant conditions for walking and cycling. 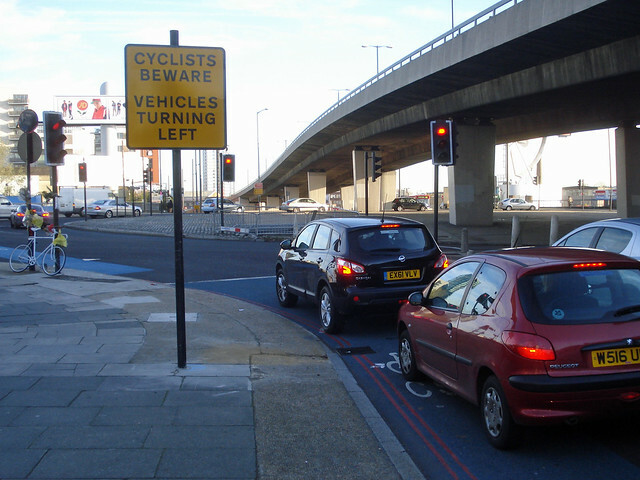 We could shorten our queues of motor vehicles quite easily, not by giving them more and more space, but by making junctions like King’s Cross not quite so subjectively – and objectively – terrifying for people on bicycles. By implementing the kinds of measures Kenji Hirasawa was talking about, in other words. But TfL apparently only know one way to shorten queues of vehicles. Giving them more and more space and time. They desperately need to start learning lessons – 40 year old lessons – from continental cities which decided long ago that attempting to accommodate growing motor vehicle traffic was a road to madness. Cities like Utrecht, the history of which you can see in this excellent video from Mark Wagenbuur. 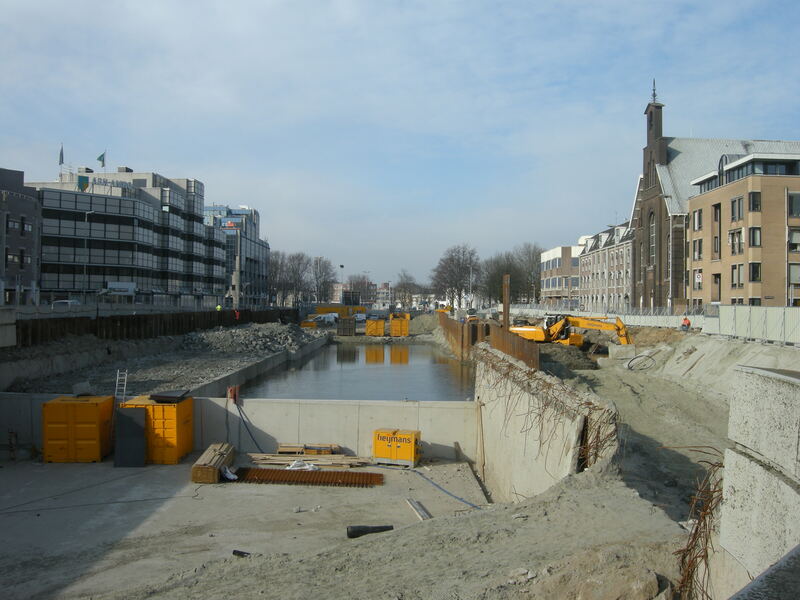 which was constructed in the 1970s, was on my last visit being stripped out, and replaced with the original canal. (The middle photo is not mine, but comes from this site). What will happen to ‘the traffic’ that was once carried on this dual carriageway? 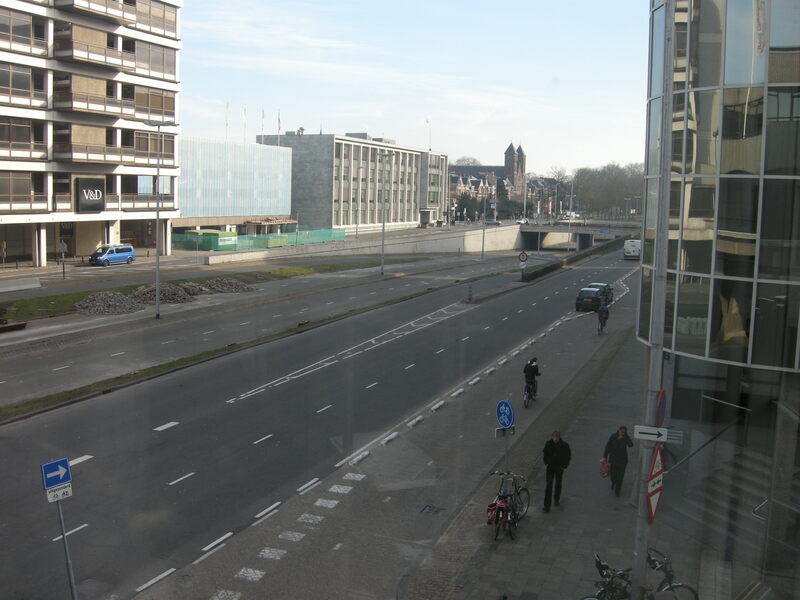 Indeed, what has happened to all ‘the traffic’ in Utrecht? The answer is that it’s still there. People are making just as many journeys as – if not more than – before. The only difference is that they are using bicycles, buses, trams and their own feet, in a city that feels safe, humane and civilized. 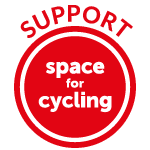 This entry was posted in ASL Abuse, Boris Johnson, Car dependence, Cycle Superhighways, Cycling policy, Infrastructure, London, Road safety, The Netherlands, Town planning, Transport for London, Uncategorized. Bookmark the permalink. Good lord! 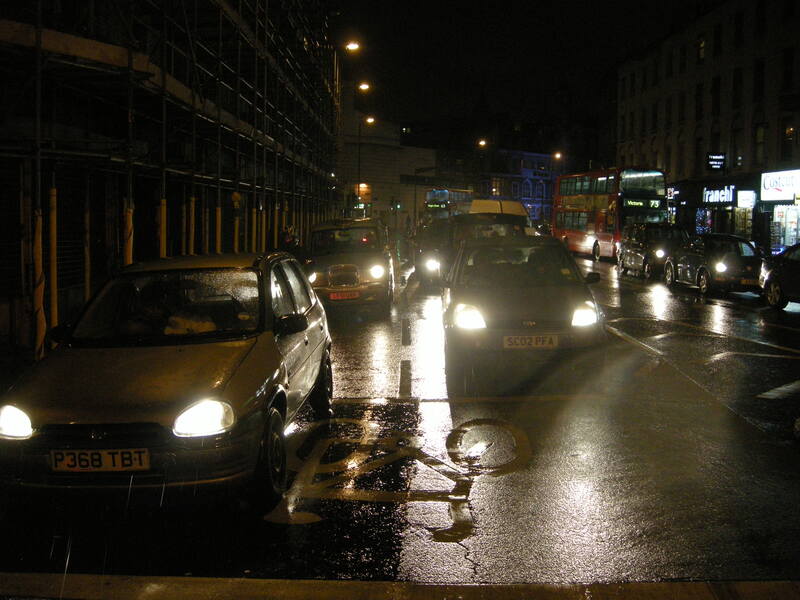 Surely you are not suggesting that motorists should risk waiting an extra light cycle to get through the lights? That could delay them for – oh, let’s see, as much as 60 seconds? The Network Operating Strategy document is full of the half-truths and misrepresentations which TfL has become notorious for. They present the traffic light timings in terms of the change to the numbers of pedestrians or a vehicles getting through in a single green phase – unsiurprisingly, vrtually all pedestrians get through in one phase before and after, so no adverse effect, excepot of course that they wait longe for the green phase. Even more blatant is their “51% of cyclists and car and van drivers who were aware of the trial, aproved of the motorbike/bus lane trial”. If they could only scrape a bare majority by conflating such obviously different constituents, what must the raw numbers have looked like??? Fantastically, well written post, I cycle through that junction every morning, and organized the Ghost Bike up for Deep Lee. At this point to make some changes we need to try to make him hold to his word. I agree that the only safe course would be to change the road approaching the junction to one lane for cyclists and one for trucks and cars. Wouldn’t London be gorgeous if the same happened here… ( streets for people not cars, rather than flattening lots of lovely old buildings! ). Thanks William – you too. I suggest putting a specific endorsement of Vision 0 on the blog.